Dumaguete City, the provincial capital of Negros Oriental, is more than just a university town and a home to the famed Siliman University. Also dubbed as "The City of Gentle People," its genuinely friendly and warm people will welcome you to its scenic spots, laid-back lifestyle, and neighboring beach resorts, peaceful sea views, as well as spectacular snorkeling and diving spots. #1 - Atlantis Dive Resorts: After a thirty-minute drive from the airport in Dumaguete, this hotel in Dauin will take you to a peaceful stretch of beach surrounded by a tropical garden. They offer five kinds of rooms to fit every guests' preference as well as different amenities such as on-site restaurant and bar, spa, outdoor pool, and a dive center in which they teach dive lessons and arrange trips to nearby underwater sanctuaries. #2 - Atmosphere Resorts: Perfectly located between the commercial establishments and the beach, this resort will definitely give you a breath of fresh air. This hotel is perfect for families as they have rooms with balcony, kitchen and dining areas, outdoor pools for adults and kids, and services including babysitting, laundry, and 24-hour room service. They also have several dining options, an on-site spa, and a dive center. #3 - Pura Vida Beach & Dive Resort: You will never run out of things to do in this resort that gives you exactly what their name means, "pure life." Aside from diving, guests can also enjoy great food at the on-site restaurant, pampering massage at the spa, fitness center, and tours around the area. They have 31 rooms with 5 different categories to ensure that you get the comfort and luxury that you want. 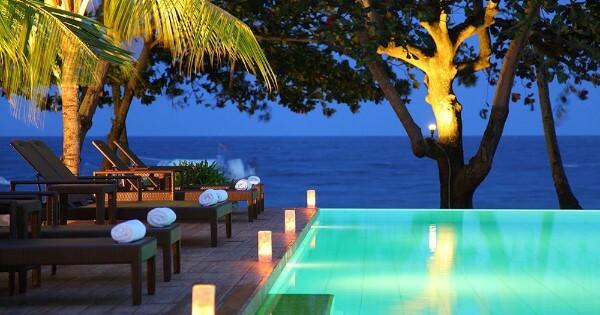 #4 - Liquid Dumaguete: Eat, sleep, and dive in this boutique resort with a tropical beach setting. It has 14 individual beachfront nipa cottages, 6 of which have deluxe airconditioned rooms and 8 are more affordable standard fan rooms. It also has a pool bar and garden restaurant, a massage cottage, and most especially an ocean rich with underwater creatures perfect for snorkeling and diving. #5 - Sea Dream Resorts: Make your dream of a relaxing holiday come true in this hotel that offers maximum comfort with their large oceanfront rooms. They also have luxurious amenities such as gym, pool, spa, conference hall, and a seaside bar and restaurant. You can also explore the inland tourist spots or underwater surroundings as their staff would readily arrange it for you. #6 - Aqua-Landia Resort: A great value for money, this hotel offers 4-star hotel service at an affordable price. It has 10 identical spacious luxury cottages, each having a kitchenette, a mini bar, air condition, ceiling fan, king size beds, flat screen TV, a work desk, and a private porch. Non-divers can also enjoy their outdoor swimming pool, tennis court, fishing area, natural hot spring bath, and a spa.